You already know that a premium acoustic guitar should be kept between 45-50% humidity, but knowing it is one thing – actually getting it there is another. And how bad is it if you’re a few percentage points off that sweet spot? Taking care of a premium acoustic is a bit like hitting the gym: you know in the long term you’ll be in better shape if you keep it up every day, even though the changes seem incremental at the time. It’s the same with your guitars: if you keep up some simple principals day to day you can keep your acoustic playing as well as the day you bought it. Also most guitar manufacturers will not cover damage done to the guitar through humidity or damp problems, even if the guitar is in warranty. So keeping your guitar safe is pretty important. Worst case scenario: Below 40% can be a bit of a horror story: less moisture in the air means the wood dries out and starts to shrink. The arch of the top and bottom of the guitar top start to flatten and the soundboard wood itself and the lacquer that coats it can begin to crack. The fretboard can shrink and because the frets themselves aren’t susceptible to variations in air moisture they won’t, so the frets will start to overhang the edge of the fingerboard, making it uncomfortable to play. Because the soundboard starts to shrink and flatten, the bracing connected to it can start to come loose, too. Worst case scenario: Although high humidity is a bit more difficult to deal with, it is generally much safer for your guitar. Just as the low RH will cause the top to drop, High RH will cause the top to rise as the wood takes on more moisture and starts to expand. This can make your action high and inconvenient to the point of unplayability, and can also limit the movement of the sound board making your guitar sound tight and less reverberant. Neither of these things are desirable, and although some mild fluctuations in RH are to be expected and any guitar will be able to withstand them, it’s best to try and avoid too much variation so that the guitar remains structurally sound and playable. OK, So what can I do about it? So, what do you do if the RH levels start to drop or climb to low or high? Thankfully, the answer isn’t just to physically take your guitar somewhere that it’s safer. That would get ridiculous. You also don’t need to keep your guitars in a room with a household humidifier to regulate the moisture levels in the air. 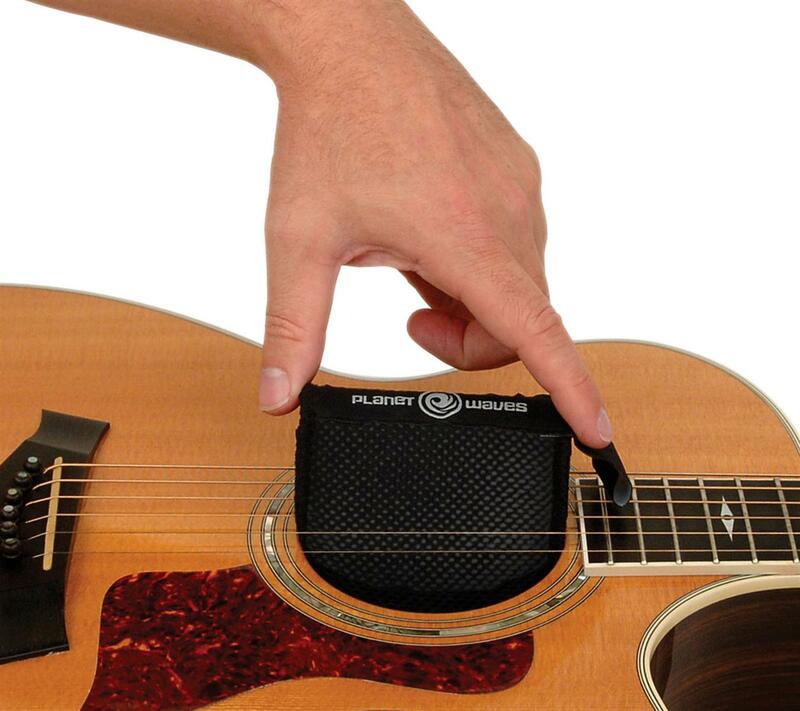 You can simply control the RH levels through the use of a tailor-made guitar specific humidifier like the Planet Waves Humidipak 2 way Humidity Control Pouch. The best thing about a product like this is that not only does it save you the hassle of having to manually regulate the level of moisture in the air, but it also saves you the grief of having to understand what RH levels are really all about! It simply monitors the RH in the guitar case once the guitar is closed away in there, and automatically adjusts it if needs be so that it stays within 45 – 50%. It’s very clever and very easy. It will add moisture to the air, and remove it as it sees fit! Basically, it consists of a jelly like substance that resides in a pack that saddles over the strings of your guitar. Once it’s there, it naturally fits down into the sound hole where the jelly goes to work. It can just be left there while your guitar is in its case and isn’t being played. It’s as straight forward as that. Water can be a useful thing. Drinking is good. So is washing. Surfing’s not far behind either. Flooding on the other hand isn’t so good. Neither is sinking (generally). Water has its pros and cons, and that’s true for what it does to guitars too. Of course, you’re never going to give your guitar a shower (right? ), but you have to appreciate that water does make up a fair bit of the air we breathe, and it can and does have an effect on the woods that guitars are made from. Because you can’t see humidity, and often don’t even realize what it’s doing to your prized acoustic until it’s too late, it helps to be able to measure it with something known as a Hygrometer (sometimes called a Humidity Monitor). Cold air won’t carry as much moisture as hot air, so when air temperature rises, so does its ability to hold more moisture. The way we heat our homes reduces the moisture content of the air. Essentially, we dry it out because we aren’t adding an additional source of moisture as it heats. So if you, or more importantly your guitar, lives in a particularly cold house that needs a lot of heating, or in a particularly hot and dry area, then you need to be aware that the RH level will be low, and you might need to take steps to protect your guitar from what is usually referred to as ‘Low Humidity Damage’. This is particularly true if your guitar is a high-end model. Although this may seem a little unfair, the cheaper models tend to be more resistant to changes in RH because they’re more solidly constructed. The fine sound and playability that comes with a more expensive guitar is largely due to the delicacy of the materials and the manner of construction that holds them together. Cheaper guitars may use plywood, but this is much less likely to crack than the solid wood. So, not only do you want to protect your expensive guitars because of their value, they’re the guitars that actually need the most protection anyway! Where does your guitar live? So what’s a good Relative Humidity reading for your guitars? First, you need to think about whether we keep the guitar in a case, or just out and about on a stand or the wall. You’ll want to monitor and (if needs be) control the relative humidity of the air that the guitar lives in. It’s generally a good idea to keep the guitar in a case if you can bear not having it on show because a case will protect the guitar from rapid changes in RH, and that sort of rapid change is a particularly bad idea. However, if it’s more convenient (or you simply can’t stand not) to have the guitar permanently out and about in your home or studio, you need to think about having a hygrometer that monitors the RH of the room it frequents. Once you’ve figured that one out, you need to look at getting the RH right. It’s wise to avoid rapid RH changes, and this is where keeping the guitar in a case tends be a good idea. When you’re going on a tour your guitar could be exposed to RH of 60% to 30% within a couple of days. It isn’t going to like that very much. It’s much wiser to try and control that variation in RH gradually between those levels of humidity and a humidifier can be much more effective when it’s controlling the levels inside the relative safety of a case so that the guitar can gradually acclimatise. More on that in a bit. It’s a good idea to let your younger guitars stabilize as much as possible: it’s in the first few years of a guitars life that it is most susceptible to RH changes. Like us humans, the older they get, the more resistant they are to change! You may have noticed that older ‘vintage’ acoustics tend to weather RH changes much better than the younger whipper-snappers about. If you can, try and get your guitar as stable as possible before subjecting it to too many changes in RH. It’s a good excuse for you to buy another ‘vintage’ guitar if nothing else! What if the guitar was built in a high/low humidity area? 45% to 50% is generally the rule, but it does depend to a certain extent on where the guitar is manufactured and the RH that the wood involved has become acclimatized to. A responsible manufacturer will build guitars in a controlled environment to avoid the guitar suffering when it finds a home with a significantly different RH. For example, if your guitar was built in a workshop with a RH level of about 65%, that guitar is likely to crack with a typical RH of more like 35%. However, the other way round is less of an issue. So if your guitar is built in a workshop with a 35% RH level, it is unlikely to crack when it lives in a 65% RH environment. The action may rise but it is unlikely to crack. In short, if you don’t monitor the environments that your guitars live in and we end up subjecting them to RH levels that harm them, they won’t like it and the quality of the construction will soon start to disappear. This in turn will effect the guitars playability and tone, and ultimately your sanity. Some folks claim that their guitar is not of the quality it purports to be when actually the guitar itself is just having to survive a warped form of water torture! As already noted, RH levels may not be that big an issue for you and your guitar where you enjoy each others company, but it’s wise to consider whether it might be. The safest and most sensible way to keep an eye on this is to purchase a humidity monitor that will let you know if you need to take action to protect your investment. 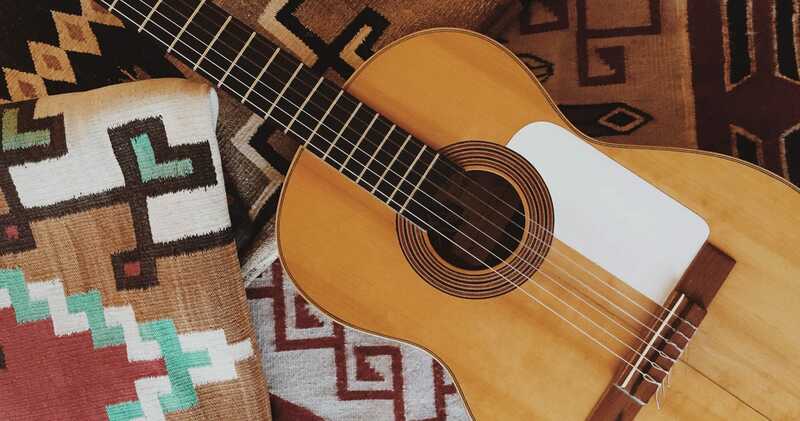 If you have made a considerable investment in an acoustic guitar, it makes good sense to invest in a humidifier like this so that you can rest easy that the guitar is properly looked after when it’s sleeping. Not only will it help ensure that the guitar doesn’t crack or warp, but it will also ensure that it remains as playable as the day it was made. Taylor have made 3 very good PDFs that cover humidity issues. Click on any of the links below for more info.